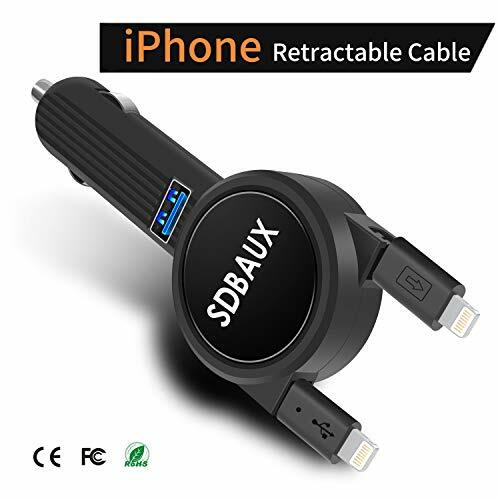 The iPhone dual retractable car charger is a new generation of intelligent electronic products,with a safe and reliable, fast charging function, a variety of devices at the same time charging, automatic protection of charging equipment and car port protection. 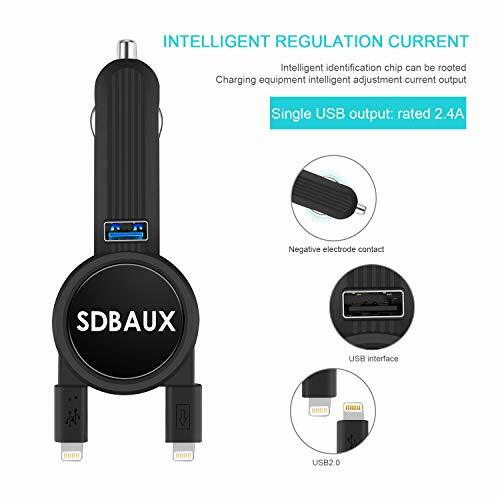 For 12V-24V interface in any car, its maximum power of 15W, maximum output current of 5V / 3.1A, It is not quick charge 3.0 car charger, but it's charging faster than normal. 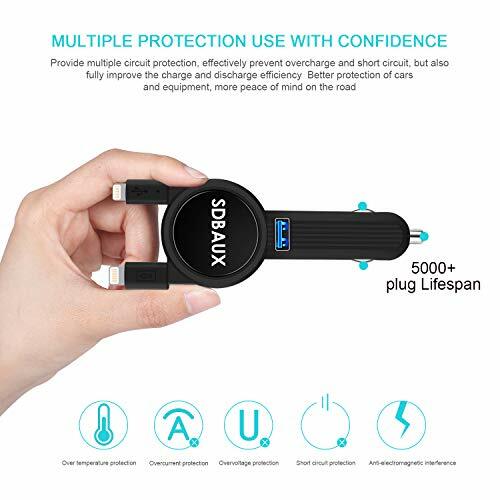 you can recharge your device battery in the shortest possible time, and when you are in the car, you do not have to worry that your device is no battery power and can not work. 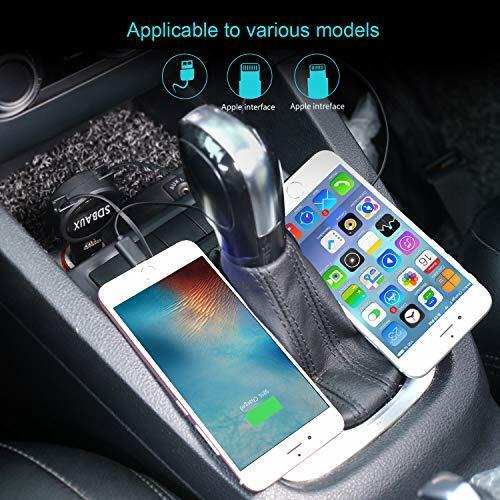 The fast car charger shell made of flame-retardant insulation material, when it in work the surface not heat, the surface of stainless steel bar is beautiful, inside the circuit board all use the highest quality electronic accessories, the car charger with over-current protection, anti-overheating automatically turn off the charging function, more secure and reliable,so you drive the car more secure. 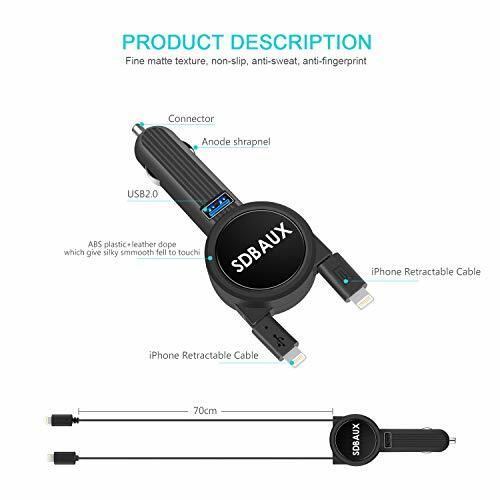 Super fast car charger with high performance, can charge three devices at the same time, have fast charging function,iPhone dual retractable cable can be compatible with iPhone XS Max XR X 8 7 6 5S Plus, iPad, iPod and other Apple devices.Single USB port compatible with Samsung Galaxy S8 S9 Plus, Note 4 / Edge, Huawei Nexus 6P , Pixel C, LG G6, HTC 11 and all USB-powered devices, including Android and Apple phones and tablets. 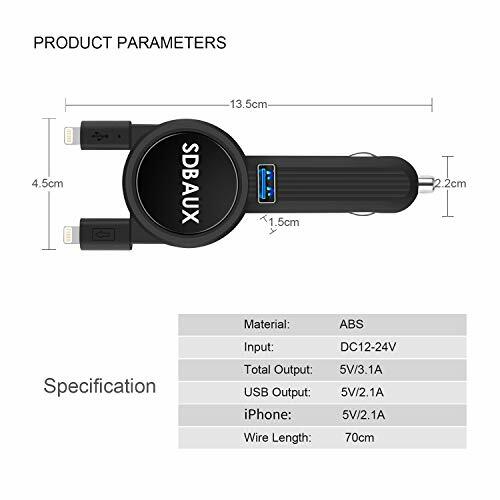 Note: When you receive our products, find any problems please contact SDBAUX after-sales team, we will solve the problem for you in the shortest possible time. Too many times I have either the charger or the cord... This ends that frustration forever! 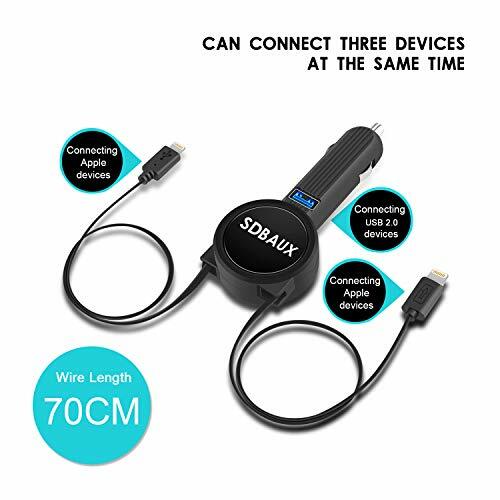 Works great at charging 2 Iphones at the same time. Cord retracts after use. Another one of life's problems solved!